Profile pictures put the “face” in Facebook – serving as an online representation of your persona (or perhaps your cat). 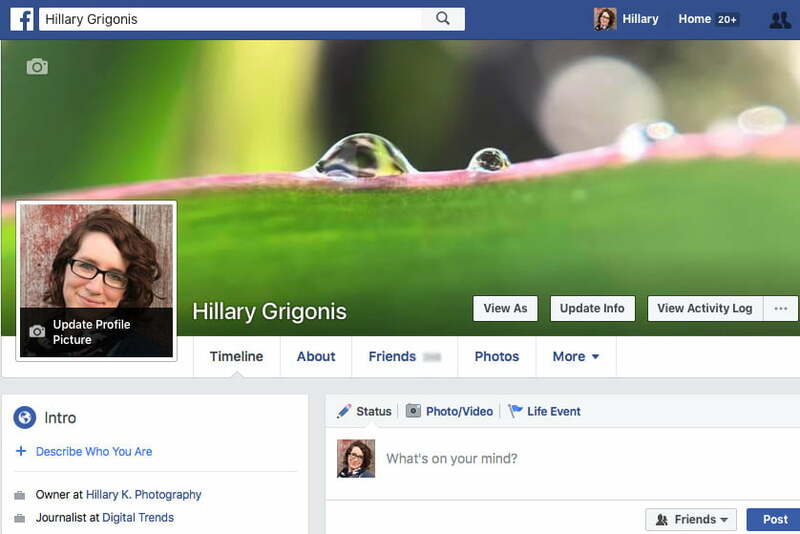 Cover photos, on the other hand, dress up your profile page with a larger image. Uploading either one is simple, but if you’re new to Facebook or can’t figure out why your profile photo looks odd, we’ve put together a simple guide on how to upload a Facebook profile photo and cover photo – and how to get fancy by uploading a profile video instead, adding a frame for a cause, using a temporary profile picture, or cropping your own image to the proper dimensions. After logging into your account, go to your Facebook page by clicking on your name at the top menu or in the left column. Hover the cursor over the profile photo (the square image). Click on Update Profile Picture when it appears. A box will pop up, with several options. You can upload a new photo or graphic, take a photo using your computer’s webcam, select a photo from ones you have uploaded in the past, or edit an existing profile photo. If you upload a new photo, make sure each side is at least 180 pixels. Don’t worry if it isn’t an exact square, since you’ll adjust the photo in the next menu. After uploading, taking, or selecting a photo, it’s time to crop and reposition it. Drag the image around to position the area you want to display, within the square box. Use the slider at the bottom to zoom in and out of the image. Hit Save to finish. If you happen to be viewing a photo that you’d like to make your profile picture, click on Options at the bottom of the screen, then Make Profile Picture. After opening the Facebook app, access the menu options by tapping on the icon with three lines in the bottom-right of the screen. Inside the menu, tap on your name to go to your page – it’s usually the first option listed. Tap on your current profile photo – the small square at the top. It should say Edit in the corner if you are logged in and on your own page. To upload a photo that you already have, tap on the Select profile picture option. Your photo library will pop up – find the one you want and tap on it. If you would like your profile picture to revert back to the old one after a certain time, tap on the Make temporary button and choose a time from the menu, or set a custom time. This option is good for changing your photo for a certain holiday without remembering to change it back later. 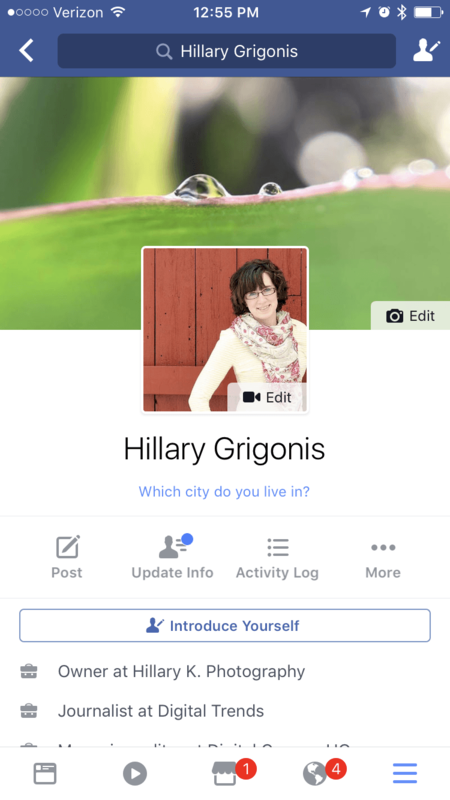 Facebook recently made it possible to use short video clips instead of a still image as your profile. Currently, the feature is only available through the Facebook app, not a desktop computer. Follow the steps to change a profile picture from a mobile device listed above (steps 1-4) – navigate to your profile, then tap on the profile picture. 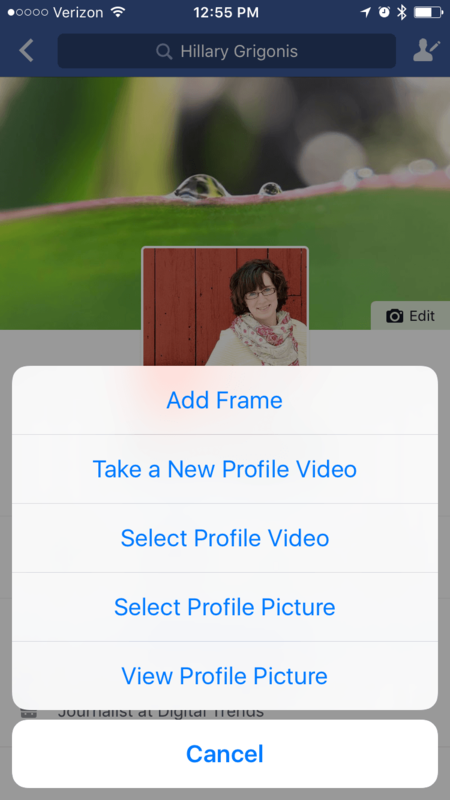 Instead of clicking on the Select profile picture, tap Select a profile video. In the list of videos that pops up, select the video you would like to use. In the next screen, you’ll have the chance to edit your video using the icons at the bottom of the screen. With the trim icon (the pair of scissors) highlighted, you can click and drag the blue bars to shorten the video. The video will play on an endless loop in the profile photo space, so highlight the best moment from the footage. If you don’t want sound to play in your profile video, tap the sound icon at the bottom and select Off. Facebook profile videos use a still frame from the video when it’s not possible to play the entire video. To choose which part of the video is displayed, tap the “cover” icon at the bottom. Then, along the video timeline at the bottom of the screen, drag your finger until you find a suitable still to use. If you don’t select a still from the video, Facebook will choose one automatically. Tap Use to finish. See those text and graphics a few of your friends have on their profile pictures, usually for a non-profit, sports team, or holiday? That’s called a Facebook Frame and it’s easy to do. Once again though, this is a feature from the app, not the desktop website. Follow those steps to change a profile picture from a mobile device (steps 1-4 above), heading into your profile page and tapping on the profile picture. You’ll be a profile picture swapping guru in no time. After tapping on the profile picture, select Add frame. You may have to approve a pop-up that gives Facebook access to your location, since some frames are location-based. 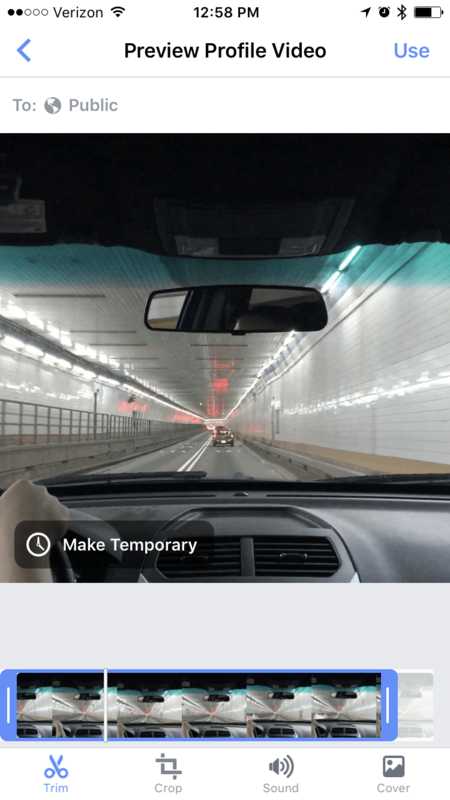 Now, you’ll see a number of different frame options – Facebook prioritizes options that your friends use first, as well as seasonal frames. You can also use the search bar at the top to find a specific frame. Once you’ve settled on a frame, just tap it. Frames automatically default to your current profile photo. If you want to swap out the photo for a different one while still using the frame, click the camera icon that says change on the top right of the photo. Underneath the preview, you’ll see options to change the frame, or to set your profile picture to expire and go back to the old version after a certain date — helpful if you are using a seasonal banner. You can also add a comment. Once you’re finished, tap Use. Once you know how to upload a profile photo, you can upload a cover photo – it’s just a different click and a bit more cropping. Navigate to your profile page by clicking on your name from the top blue menu bar. Hover your mouse over your current cover photo, then click on Update my Cover Photo. Select Choose From My Photos if you’ve already shared the photo on Facebook, or Upload Photo if you haven’t shared the photo you want to use yet. Click on the photo you’d like to use — if you’re uploading a new photo, double click or single click then use the Choose button on the bottom. You’ll be redirected to your profile page, where you can adjust the crop on your cover photo. Click and drag the mouse vertically to make changes. Note that you can’t crop the photo horizontally, which is why it’s usually best to choose a wide photo shot in the landscape orientation. Once you’re finished cropping, click Save Changes. Alternatively, you can also change your cover photo when viewing a photo by clicking on Options on the bottom of the screen and choosing Make Cover Photo. Inside the Facebook app, navigate to your profile page by clicking on the menu icon (the three lines in the lower right) and selecting your name from the top of the list. Tap on the cover photo. Choose Upload Photo if you have not yet shared the image to Facebook yet, or choose Select Photo on Facebook if you have already shared the image. Find the photo you would like to use and tap on it. On the next screen, use your finger to drag the image vertically to crop to the proper size. Tap Save to finish. Uploading a profile photo	What sizes should Facebook profile and cover photos be?